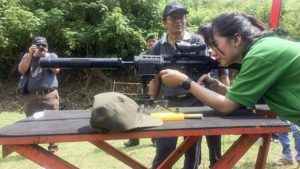 On June 9th, 2016 the state-owned Indonesian defense company PT Pindad launched four new small arms systems. 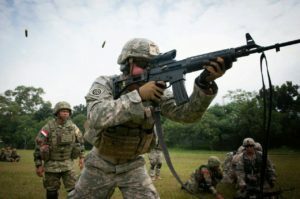 Included was a new rifle named the SS2-V7 Subsonic. 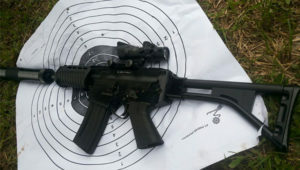 This new rifle is based on the standard issue SS2 which was introduced to the Indonesian military in 2006. The SS2 is an entirely Indonesian designed weapon and was developed to replace the SS1 which was a licensed copy of the Belgian FN-FNC. The SS2 uses a gas piston design similar to the Kalashnikov. The table shows a trajectory numbers that are similar to a subsonic 300AAC bullet, however energy delivery tells a different story. Energy at the muzzle is at best equivalent to a standard FMJ 380ACP round. This is less than half the energy delivery of a standard 300AAC cartridge. For close in operations a suppressed SMG like the MP-5 SD may be a be better choice. However, this setup might be a good choice if an entry team member is carrying magazines loaded subsonic and supersonic which could easily be switched out after taking out sentries and/or lights in a stealthy manner.